Vinhomes Riverside Hanoi is located in Long Bien district, Hanoi and considered the most livable urban area in Hanoi as well as in Vietnam. This compound was built according to the balance between natural and people, creating a dream city that meets all the needs of all residents. 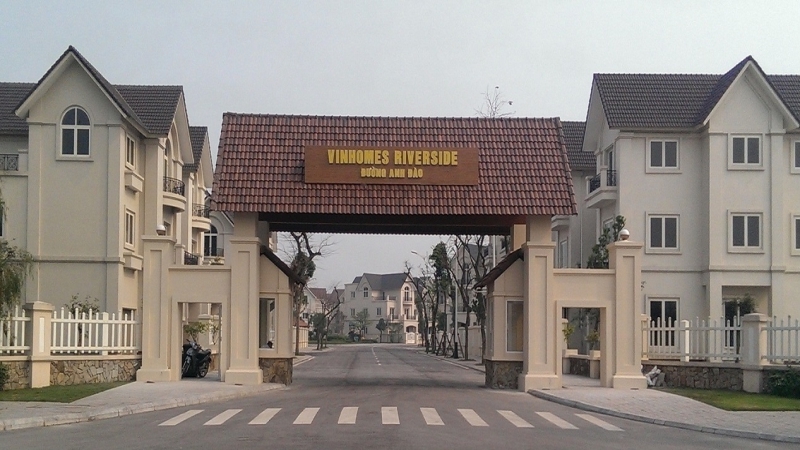 Location: Situated at the northwest of Vinhomes Riverside, closed to Viet Hung urban area. Designed in modern, neo-classical style, it is very exclusive, all villas are detached one and very spacious. This villa area is surrounded by plenty of green trees and the total area of artificial river and lake occupies up to 60% of the total area. There are security office, which operates 24/24 hours in every villa area, ensuring absolute safety for residents and personal privacy. Bang Lang villa area BL01 consists of 06 villas. Bang Lang villa area BL02 consists of 068 villas. Bang Lang villa area BL03 consists of 13 villas. Bang Lang villa area BL04 consists of 09 villas. Bang Lang villa area BL05 consists of 18 villas. Bang Lang villa area BL06 consists of 12 villas. Bang Lang villa area BL07 consists of 10 villas. Bang Lang villa area BL08 consists of 08 villas. Bang Lang villa area BL09 consists of 07 villas. Bang Lang villa area BL10 consists of 13 villas. Bang Lang villa area BL11 consists of 08 villas. Bang Lang villa area BL12 consists of 11 villas. Location: situated at the northeast of Vinhomes Riverside Hanoi villa, next to Almaz Convention Center, the sport complex, BBQ garden, British International School and other amenities. Hoa Lan villa area has been divided into 9 blocks, numbered from HL01 to HL09. Hoa Lan villa area HL01 includes 08 detached villas and 28 duplex villas, this area is closed to Almaz Convention Center, the sport complex, BBQ garden of Hoa Lan villa area. Hoa Lan villa area HL02 includes 07 detached villas and 08 duplex villas, opposite to the , British International School via Hoa Lan road. Hoa Lan villa area HL03 includes 05 detached villas and 12 duplex villas, surrounding the kindergaten. Hoa Lan villa area HL04 includes 06 detached villas and 12 duplex villas. Hoa Lan villa area HL05 includes 10 detached villas and 26 duplex villas, which have been symmetrically arranged via Hoa Lan road. Hoa Lan villa area HL06 includes 12 detached villas and 20 duplex villas, which have been built in the same design as the HL05. Hoa Lan villa area HL07 includes 08 detached villas and 04 duplex villas, which have been built with low construction density, creating a spacious living enviroment with river view and street view. Hoa Lan villa area HL08 includes 16 detached villas and 26 duplex villas, surrouding the playground. Hoa Lan villa area HL09 includes 07 detached villas and 06 duplex villas, belonging to the intersection of Hoa Lan and Hoa Sua road, closed to golf course and the playground. 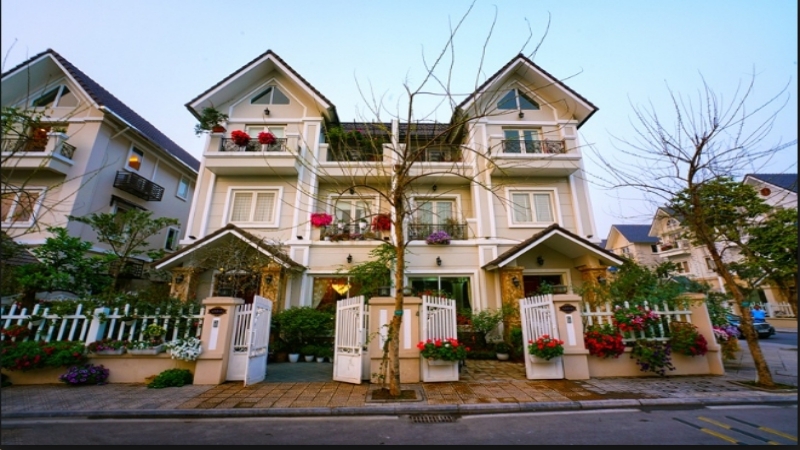 Orchid villa area is situated in the most quiet place in Long Bien district of Hanoi. Just 6.5km far away from Hoan Kiem Lake, 5.5km far away from Chuong Duong Bridge and very closes to Vinh Tuy Bridge. From this location, you can access to key ensemble of Hanoi via roadway and elevated highway system. Orchid villa area is home of 221 stunning villas, which are totally separated from the noise and crowds, but still close to all the city's events. All villas in Orchid area have been designed in neo-classical style, most of them are detached villas and the rest are duplex villas with diversified area, meeting the various requirements of customers. These exclusive villas are settle in lush green gardens so you can enjoy the green sceneries out of each window. The low density housing promises to be quiet and private, this place is the best option for you and a perfect place to bring up your kids. These villas have been featured with an artificial canal system and over 600,000 sq m of greeneries, this is an ideal place for residents to enjoy the gentle rays of sunshine, the cool breezes blowing off, fishing, roaming or sightseeing. Being well-known as a self contained urban area, residents live in Vinhomes Riverside Hanoi in general and those live in Orchid area will be offered a wide range of luxury services and superior amenities such as swimming pools, tennis court, shopping center (Long Bien Vincom Center), restaurant, coffee shop, food court, BBQ garden, amusement park, healthcare center, banking services, international school systems. Vinhomes Riverside is known as “Land of Peace”, where residents can enjoy all the benefits of a safe, active and enviable luxury lifestyle in a lively and simulating environment. Orchid villa area possesses many exclusive and outstanding villas of Vinhomes Riverside. There is sufficient space between each two villas, ensuring the absolute privacy for home owners. Besides great landscapes, Orchid villa area is also adjacent to Duong River. Residents always have opportunity to admire the romantic beauty of this river, enjoy fresh air and soothing scent of orchid flowers everyday. Every villa in Orchid area owns outstanding river view and beautiful backyard landscape. 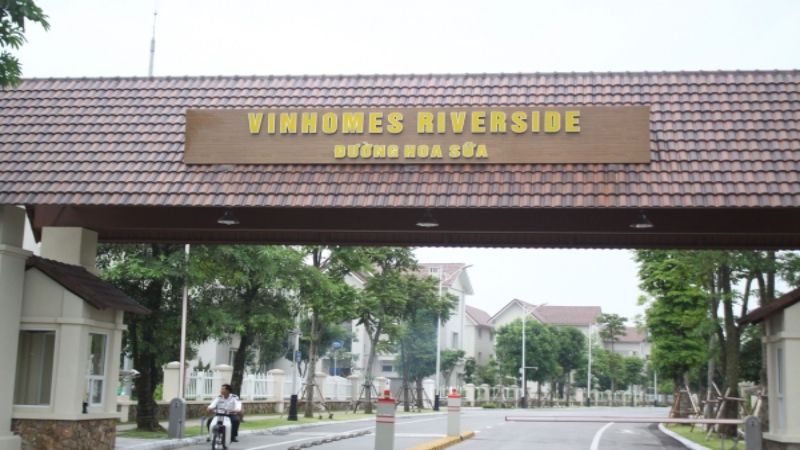 Villa Vinhomes Riverside prouds themselves on providing the best facilities for residents. >>> Visit Ciputra Hanoi, please kindly contact us for further information about this complex. This is a famous complex in Hanoi you want to know when you are living in Vietnam. The northwest is contiguous to Anh Dao villa area and a part of Hoa Phuong villa area. 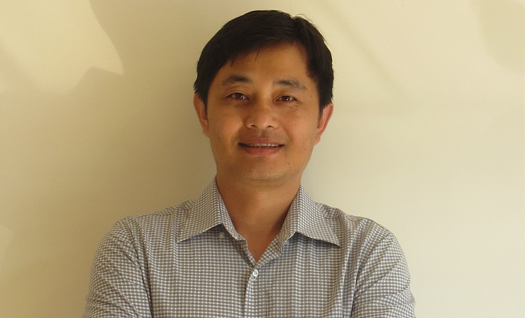 The northeast is contiguous to Hoa Lan villa area and a part of Hoa Phuong villa area. The south and southeast is adjacent to Sai Dong urban area. Hoa Sua villa area consists of detached villa and duplex villa, in which the duplex villa takes 80% in total. Hoa Sua villa - HS01 includes 15 detached villas and 38 semi-detached villas with area ranging from 200 to 390sqm. Hoa Sua villa - HS02 includes 02 detached villa with area of 300sqm and 28 semi-detached villa with area of 210sqm, there is a playground in the front. Hoa Sua villa - HS03 includes 14 detached villas and 48 semi-detached villas, which have been built along Hoa Hong street. Hoa Sua villa - HS04 includes 12 detached villas and 18 semi-detached villas. Hoa Sua villa - HS05 includes 13 detached villas with area of from 290sqm to 500sqm and 60 semi-detached villas with area of 250sqm. Hoa Sua villa - HS06 includes 12 detached villas with area of from 280sqm to 350sqm and 26 duplex villa with area of 250sqm, next to the food court area. Hoa Sua villa - HS07 includes 11 detached villas and 20 semi-detached villas, there is a playground here, next to the Vinhomes Golf Club. Hoa Sua villa - HS08 includes 35 detached villas, which have been alternately built to make more space for residents. Hoa Sua villa - HS09 includes 07 detached villas and 32 semi-detached villas, which have been built alternately or shaped of fan tail staircase applied for villas locates in the circle. 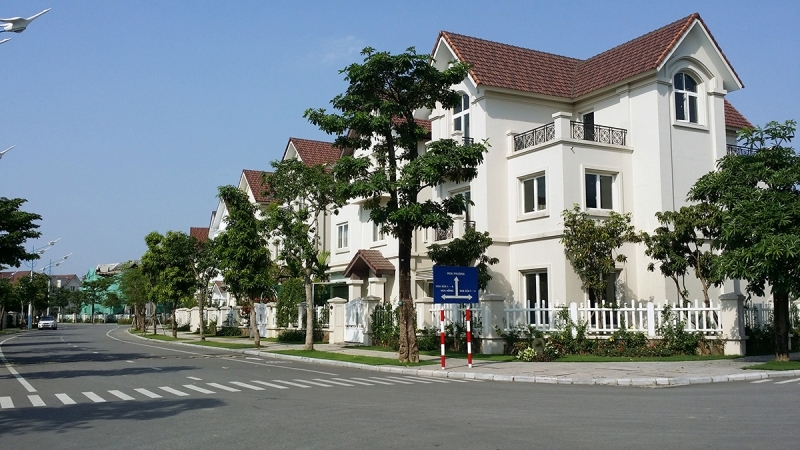 Hoa Sua villa - HS10 includes 13 detached villas and 46 semi-detached villas, which have the same design as HS09. 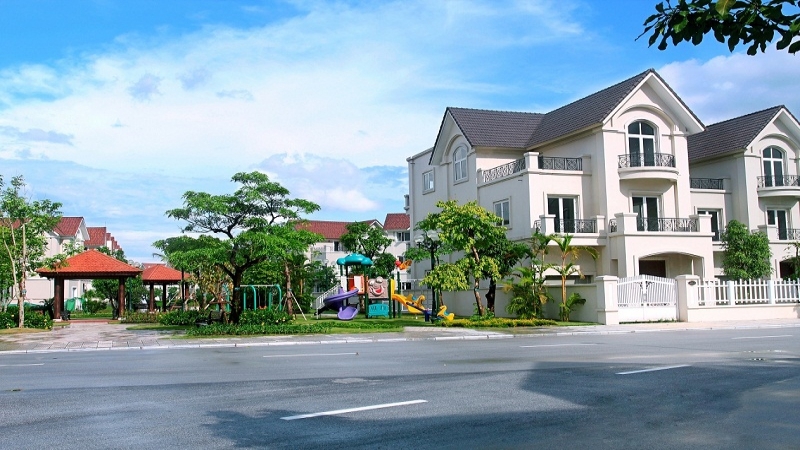 Hoa Sua villa - HS11 includes 12 detached villas and 66 semi-detached villas, surrounding the playground, closes to the circle of 45 road and Sai Dong urban area. 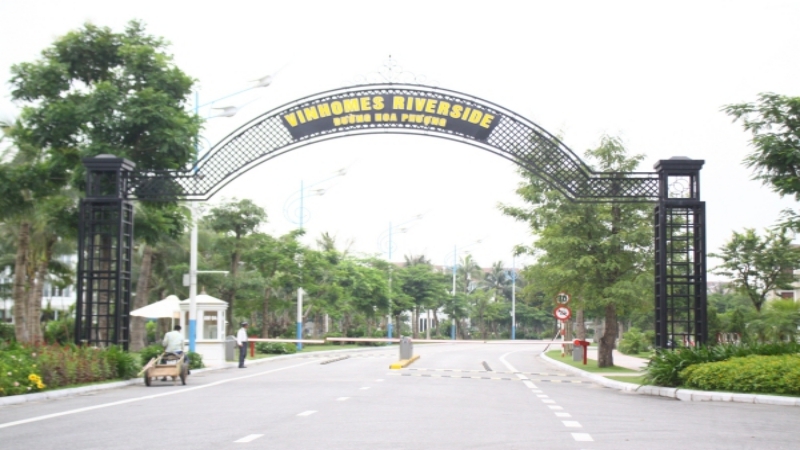 Location: consisted of 2 area, spreading on Hoa Phuong route, it is very convenient to use amenity system in Vinhomes Riverside urban area such as shopping, relaxing, entertaining, learning, playing sport, trying food, etc. Hoa Phuong villa area 01 is consisted of 61 detached villas, villa area is ranging from 300sqm to 600sqm, opposite to Bang Lang villa area. Hoa Phuong villa area 02 is included of 22 detached villas, area is ranging from 300sqm to 600sqm, surrounding the playground and oppossite to Bang Lang villa area. Hoa Phuong villa area 03 is comprised of 51 detached villas, area is ranging from 300sqm to 600sqm, opposite to Bang Lang villa area, behind commercial center Vincom Long Bien and Kindergarten Vinschool. Hoa Phuong villa area 04 is home of 21 detached villas, ranging from 313sqm to 437sqm and 22 semi-detached villas, ranging from 187sqm to 224sqm, next to Anh Dao and Hoa Sua villa area. Hoa Phuong villa area 05 includes 03 detached villas and 16 semi-detached villas with area ranging from 262sqm to 422sqm, surrounding the playground. Hoa Phuong villa area 06 consits of 8 detached villas and 22 semi-detached villas, including staggered design, which makes villa seem to be more spacious. Hoa Phuong villa area 07 includes 71 small detached villas, area ranging from 131sqm to 189sqm with one side of villa faces the street and another faces the river. Hoa Phuong villa area 08 comprises of 11 detached villas and 34 double villas, next to golf course and other amenities area. >>> Tay Ho area in Hanoi you need to know about this area. This area is one of the best place foreigners to choose to stay in Hanoi. The north and northwest is contiguous with a road, which is 81 meters in length, leading to Vincom Plaza – Shopping center, close to the rotation of Vinhomes Riverside villa. The northeast is contiguous with BBQ garden and Sport complex. The southeast is contiguous with Hoa Hong road, Hoa Sua villa area and 5-star standard hospital-hotel. Anh Dao villa area – HS01 includes 12 river view villas and 10 core villas, area is ranging from 161.5sqm – 337.7sqm. Anh Dao villa area – HS02 includes 04 river view villas and 19 core villas, area is ranging from 161.5sqm – 372.4sqm. Anh Dao villa area – HS03 includes 04 river view villas and 24 core villas, area is ranging from 161.5sqm – 337.7sqm. Anh Dao villa area – HS04 includes 04 river view villas and 20 core villas, area is ranging from 161.5sqm – 389.7sqm. Anh Dao villa area – HS05 includes 06 river view villas and 12 core villas, area is ranging from 161.5sqm – 443.6sqm. Anh Dao villa area – HS06 includes 26 core villas, area is ranging from 142.3sqm – 240.4sqm. Anh Dao villa area – HS07 includes 14 river view villas and 9 core villas, area is ranging from 148.7sqm – 388.7sqm. Anh Dao villa area – HS08 includes 30 river view villas and 40 core villas, area is ranging from 142sqm – 529.2sqm. Anh Dao villa area – HS09 includes 36 river view villas and 40 core villas, area is ranging from 135sqm – 483.9sqm. Anh Dao villa area - HS10 includes 04 river view villas and 18 core villas, area is ranging from 133.3sqm – 356.9sqm. Anh Dao villa area - HS11 includes 05 river view villas and 12 core villas, area is ranging from 143.9sqm – 337.6sqm. Anh Dao villa area - HS12 includes 07 river view villas and 09 core villas, area is ranging from 152.9sqm – 444.9sqm.